Additionally, Moog Animatics' extensive library of sample code allows application-specific presentations to be created without years of SmartMotor™ programming experience. This allows proof-of-concept demonstrations to be quickly designed and shown in your office, so you can be confident that SmartMotor™ products will deliver the quality, ease of use, value and capability that you need. The portable SmartMotor™ Three-Axis Demo Systems are available now. Be sure to ask your Moog Animatics distributor or sales rep about seeing the portable SmartMotor™ Three-Axis Demo System for your next application! 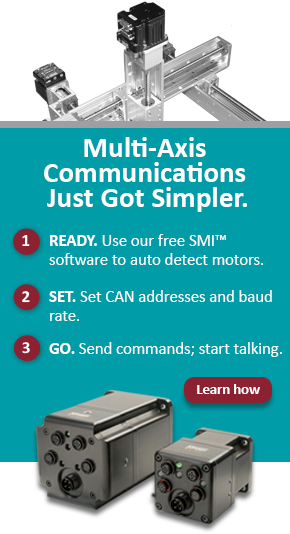 Learn more about the SmartMotor Three-Axis Demo System.